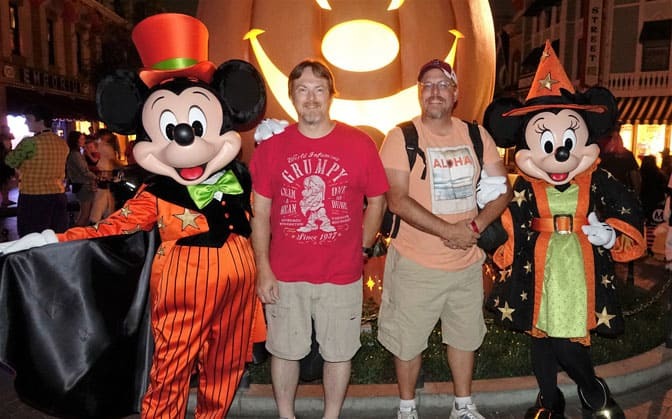 On Friday night, my brother and I set out to enjoy the 1st Mickey’s Halloween Party at Disneyland. Here’s how our night went and some tips that might help you. You have two options in obtaining your wristbands. 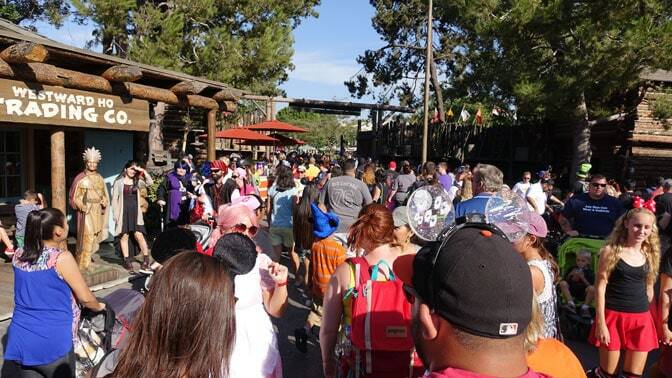 If you are already in the park, you can get your band at the entrance to Frontierland. We arrived a few minutes past 4 pm and waited about 20 minutes. The line started next to Westward Ho and went to the hub and then back to the same area to pick up the wristband. You are given a trick or treat bag and map as well. EACH person MUST be present, they will not hand you a wristband to give to someone else. For those outside the park at 4pm, you may pick up those items with your wristband at the Main Gates. 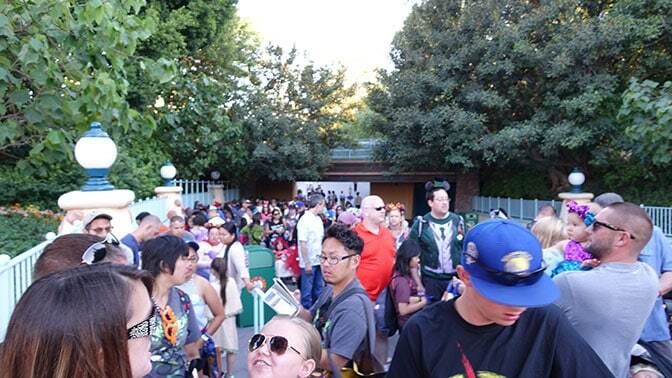 The pre-party in Toontown continues its annual tradition and the line wasn’t allowed to form until 5pm. 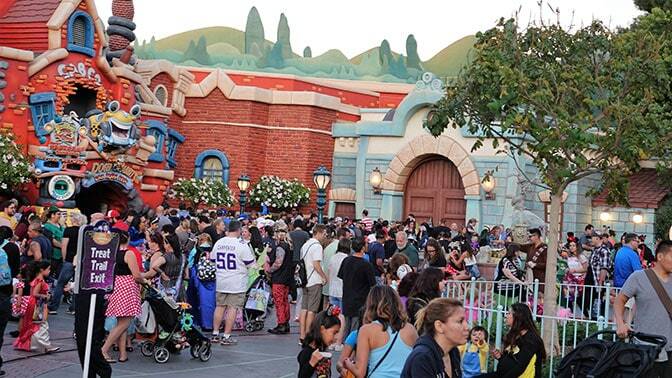 Toontown will open ONE hour before the official party start time and remain open for TWO hours. 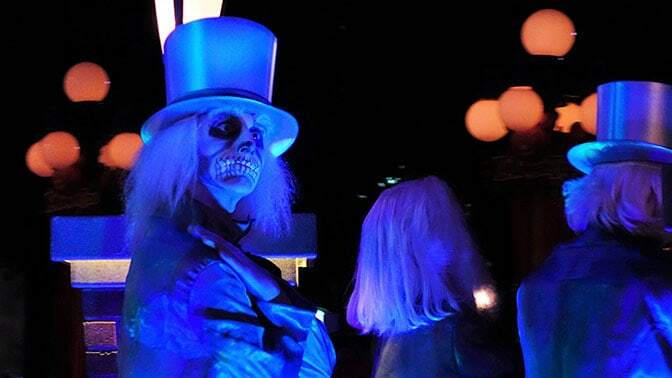 There’s trick or treating, a couple of rides and Disney characters in Halloween Costumes. Line up exactly 5pm if meeting characters is important to you. I was surprised how many were lining up just to get candy. Here’s the ginormous line at 5:30pm. It stretches all the way back to it’s a small world and it’s doulbe line. 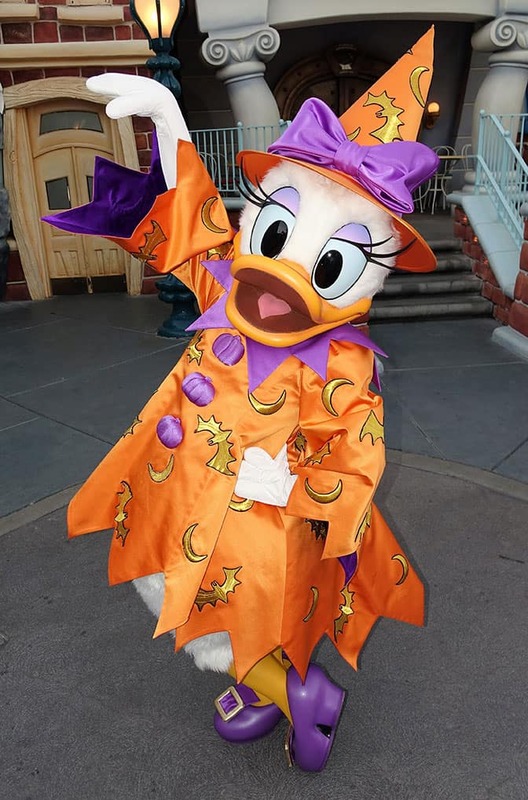 Many characters appeared in the same costumes as they did in 2015. 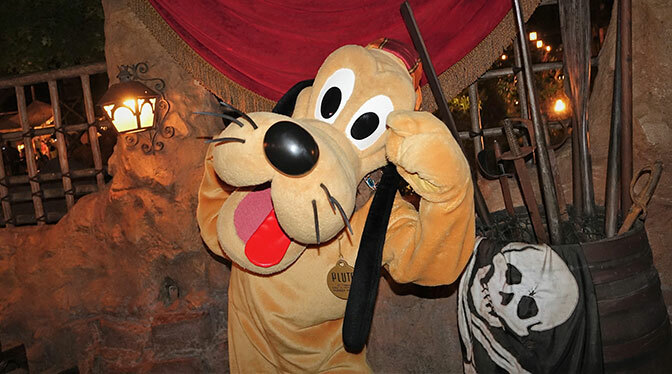 Mickey and Minnie were Zorro and Candy Cane, Donald was a Sorcerer, Goofy was a Candyman and Pluto had his vampire collar. 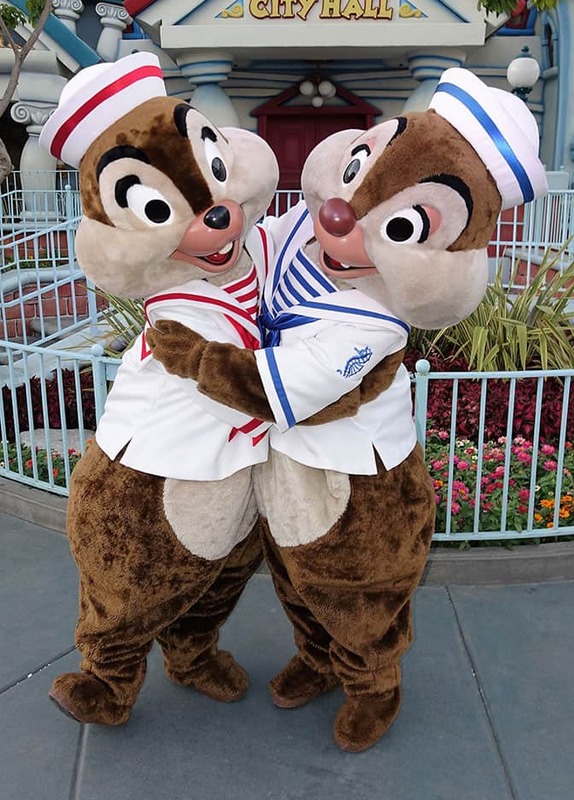 Mickey and Minnie took the City Hall meet first, then switched with Chip n Dale. The line was about 30 to 45 minutes once it had formed. 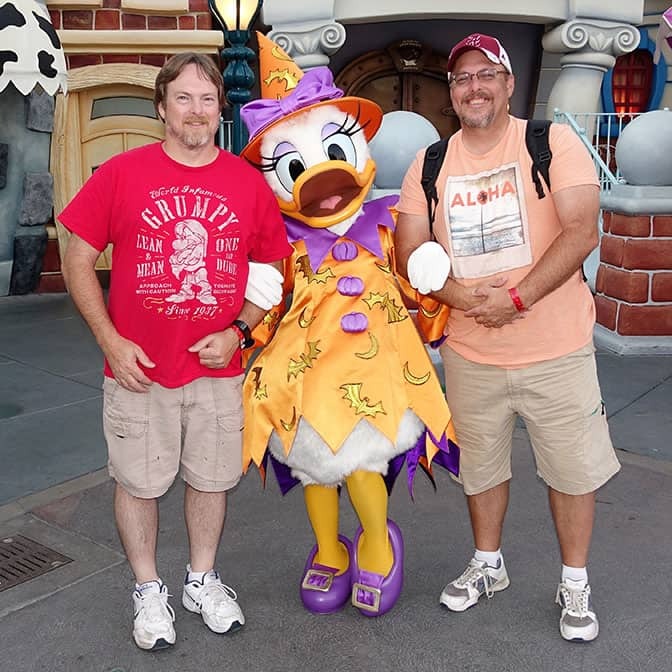 We were first for Mickey and Minnie, then first to meet Goofy as well. 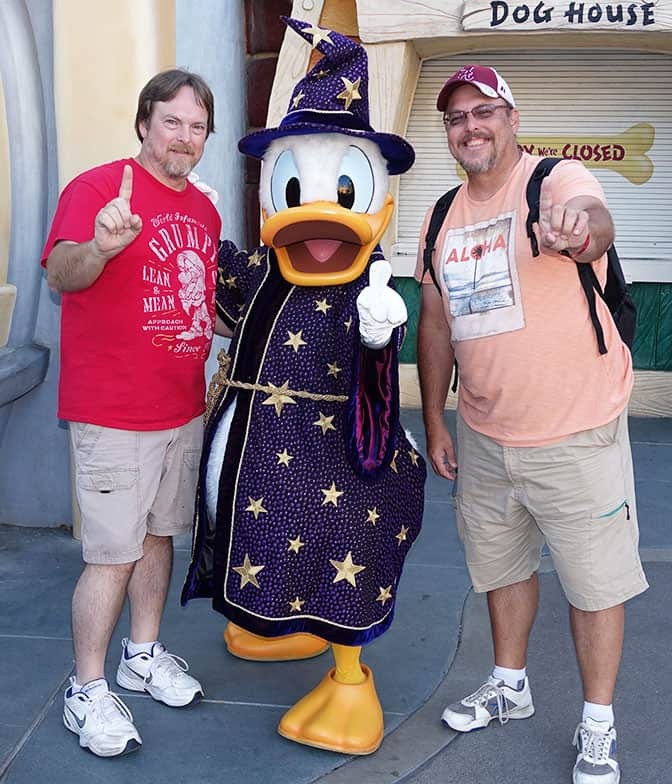 There was a short wait for Donald, so we quickly got in line for him as well. 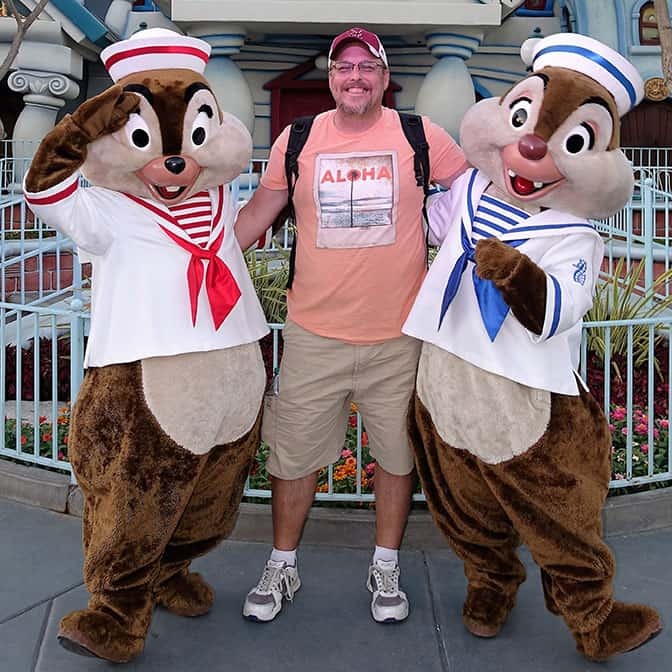 We immediately got back in line to meet Chip n Dale. They were dressed as sailors this year. They were Cop and Robber last year. 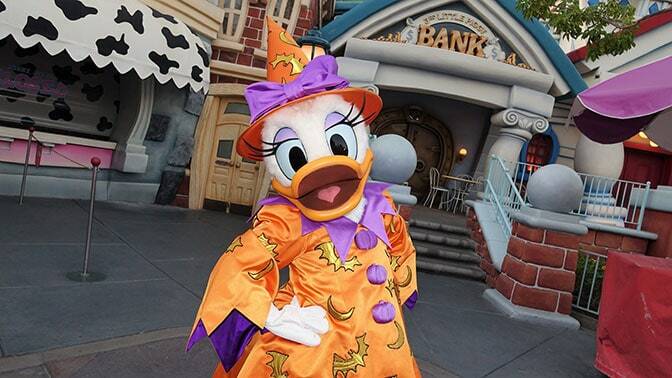 Daisy had a different costume than she wore last year and she alternated with Donald, so we met her as well. They had these scarecrow with pumpkin on their heads guys next to a sign and people waited 10 to 15 minutes to meet them. There were 2 candy lines, but we chose to skip them as they were long and we could get candy later and not carry it around 5 more hours. 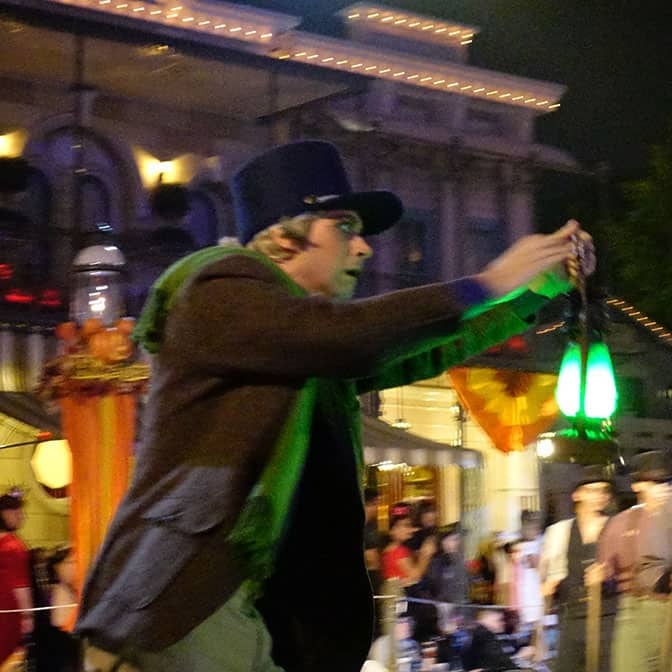 I do love how Disneyland continues to do them as TRAILS, so there is usually 3 to 5 candy stops on each little trail. You can fill your bag much quicker here than WDW. 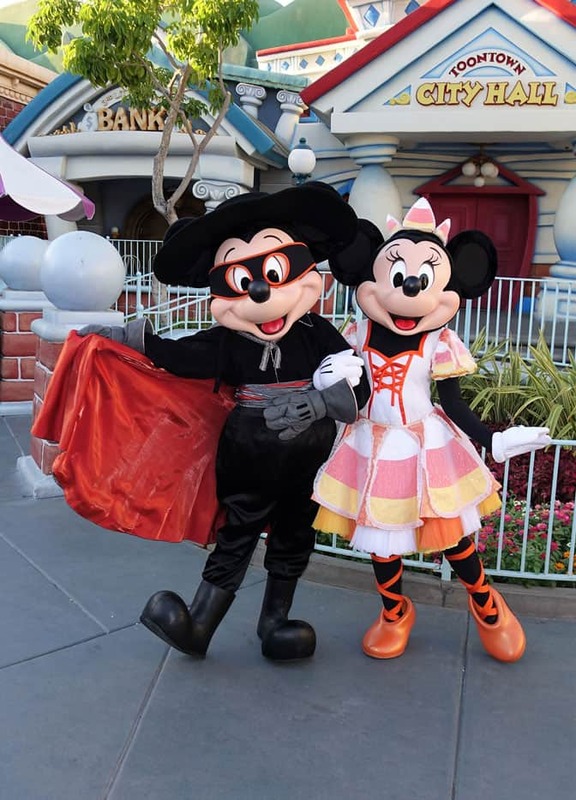 We made our way to Town Square to check on the Villains meets and Mickey and Minnie would do their regular meet in Town Square as well. REALLY bad news for 2016. Most villains meets have been eliminated. 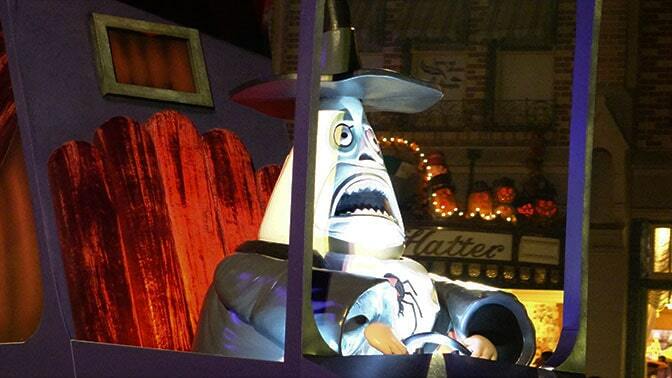 Last year you could meet 8 or 10 villains in Town Square, this year the total is FOUR. 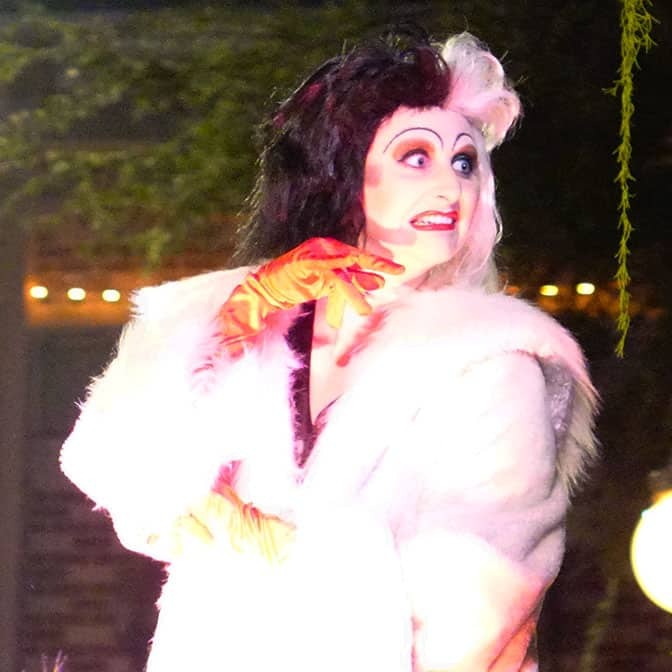 Cruella alternated on one side of the Railroad Station with Queen of Hearts (Left side when facing the station) and Maleficent and The Queen alternated on the Right side facing. 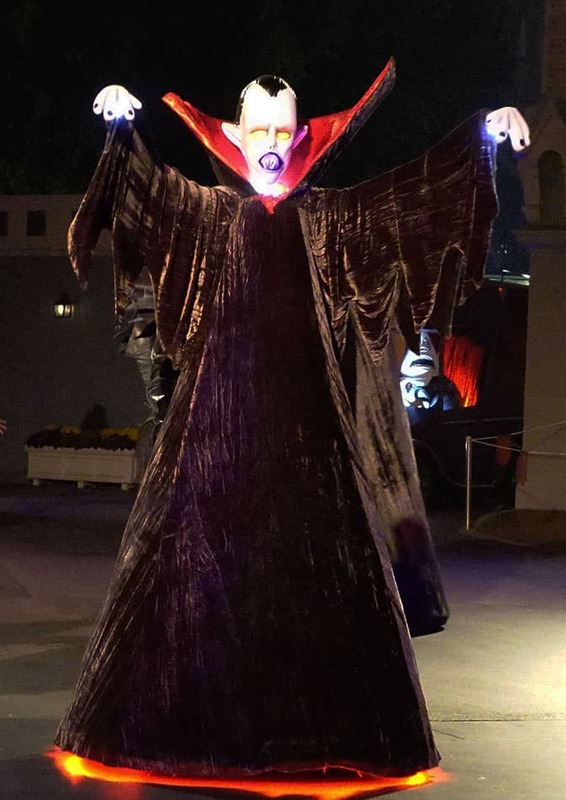 Maleficent is the only rare one, you can meet The Queen and Cruella most days in Disneyland and Queen of Hearts is out daytime during Halloweentime. 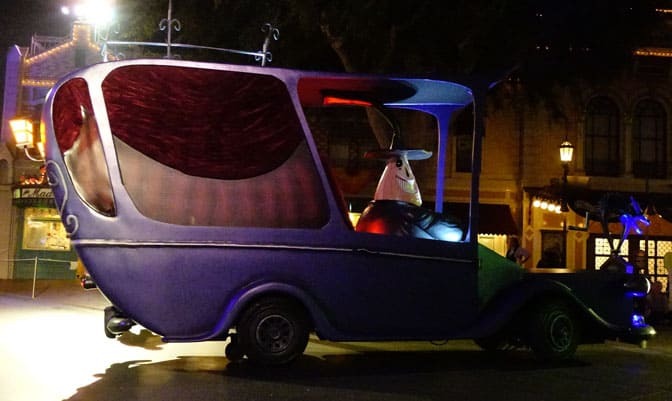 Villains and Mickey and Minnie didn’t begin until at least 7:45pm and took breaks for parades and fireworks. 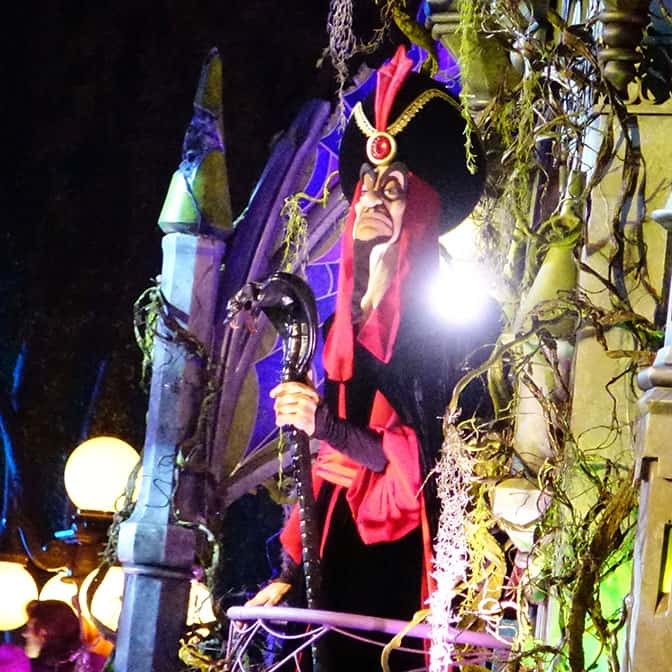 Other villains you can meet during the day include Gaston, Jafar, Jack Skellington, Dr. Facilier, Capt. Hook and Kylo Ren. 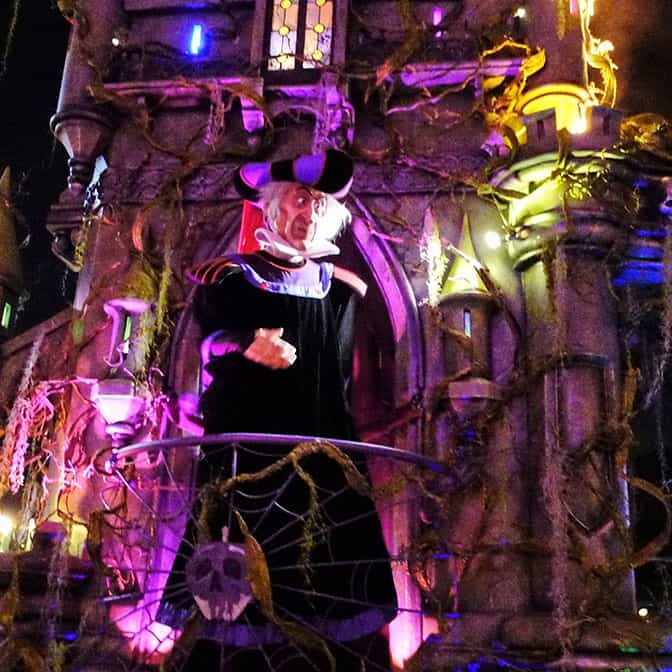 I haven’t seen Frollo out, but it’s possible you might find him in Fantasyland too. 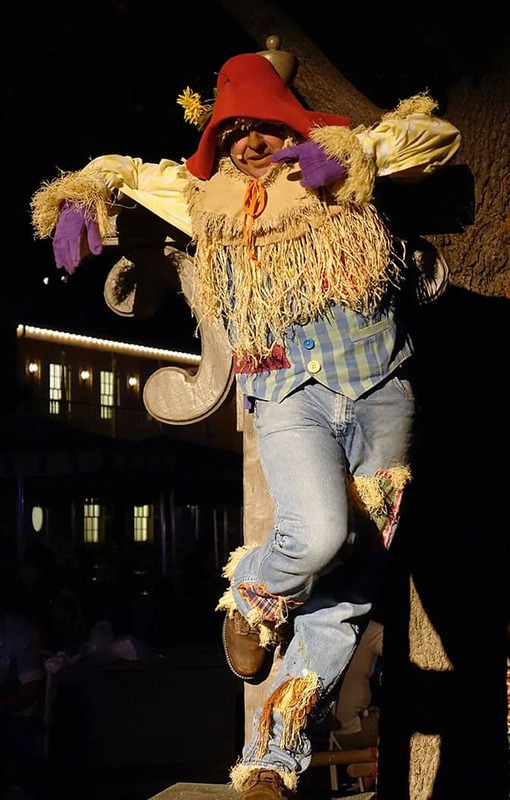 The scarecrow entertainers continue in Frontierland and Ranch del Zocalo. Jessie was alternating with Woody at the Petrified Tree. I didn’t see Bullseye, but may have just missed him. I’ll check again Monday. Woody is out here every day and both of them meet in DCA too. 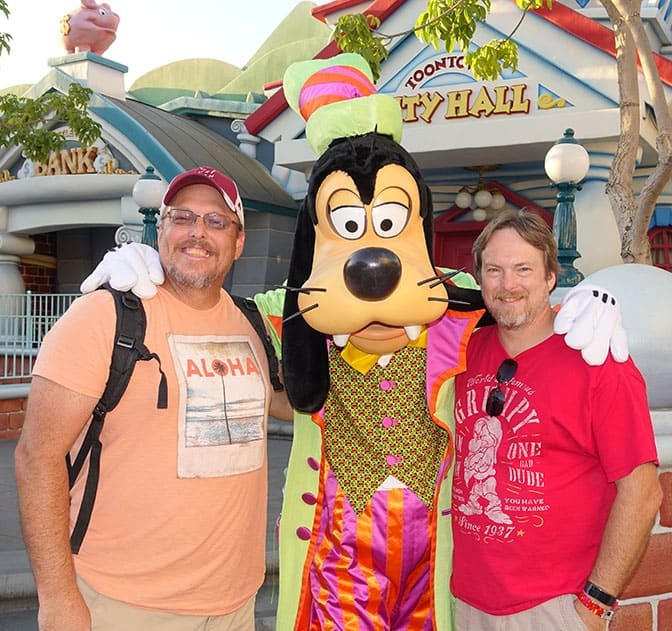 We made our way to Rancho del Zocalo with the goal to meet Goofy. 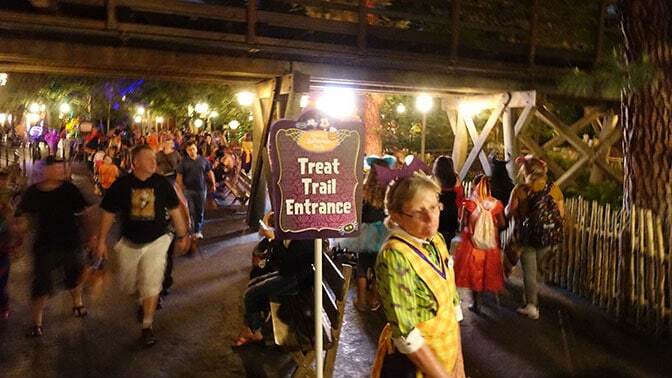 We were told we could only enter the meet and greet by doing the trick or treat trail. Okay, we’ll grab some sugar, popcorn and chips fo for energy. The characters only had about a 10 minute line and they alternated about every 15 minutes. 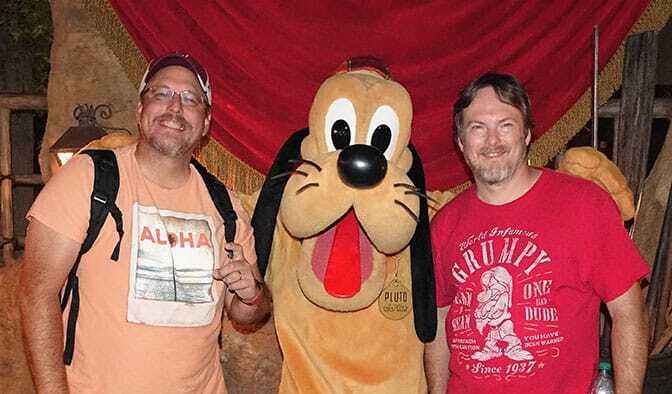 We saw Chip n Dale, Donald, Pluto and Goofy in their pirate costumes. 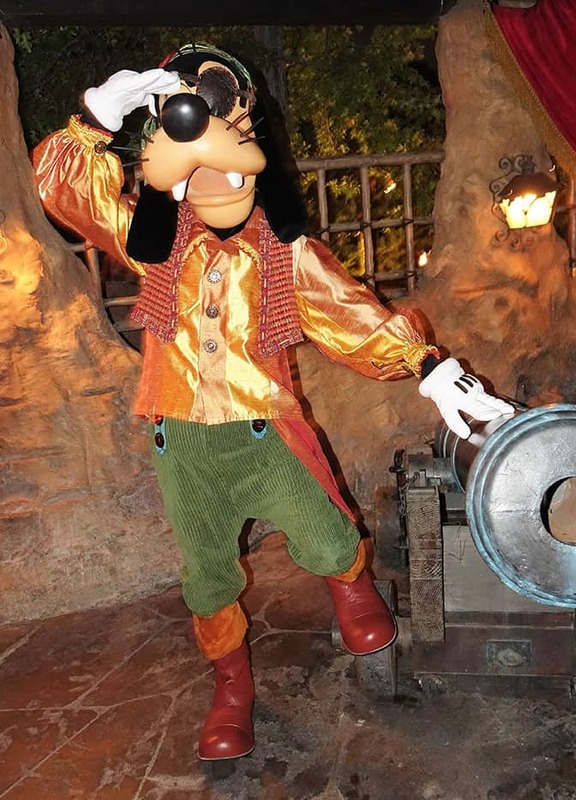 Goofy was a few minutes late from what the Cast Member was able to find, but it was worth waiting around for my favorite character growing up in full pirate garb! The Cast Member loved my TOURIST costume. From there we enjoyed the Cadaver Dans on the River. We weren’t sure if they would continue to peform on the raft on the river with it closed for construction, but they did and it was great as always. There are allergy alternatives and healthy stuff like apples, carrots and health bar things. We liked the new Yoo Hoo bars. 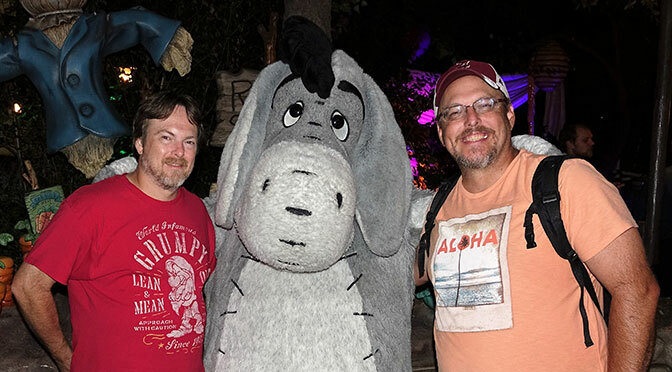 When we arrived it was Tigger and Pooh meeting, but they left and Eeyore came out. 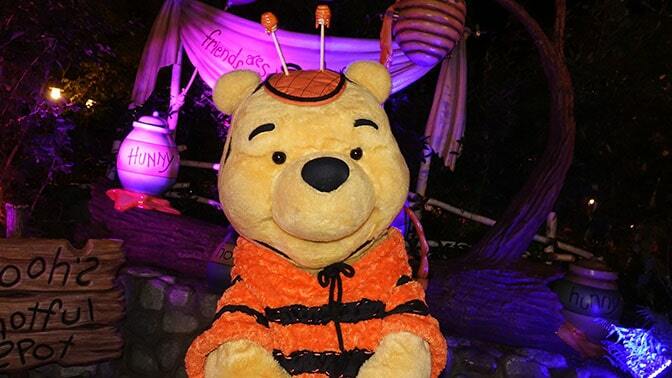 Tigger was only a little behind after getting some hunny. Isn’t he adorable. 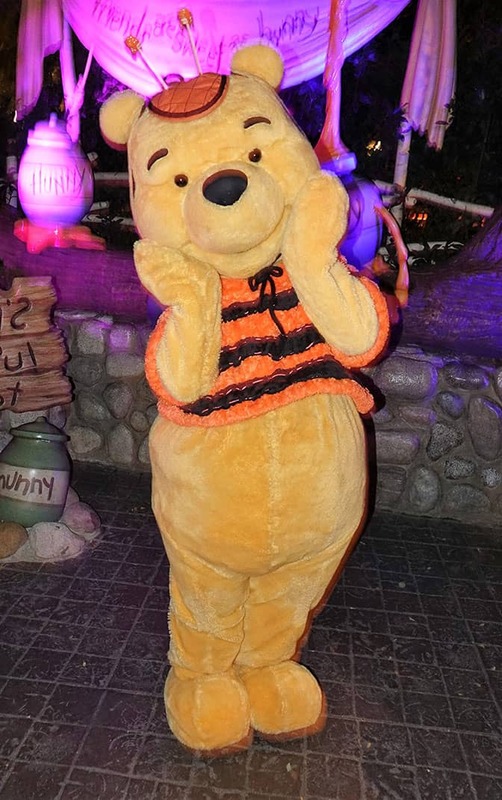 I nicknamed my oldest child “Pooh Bear” when she was a baby. I should get her this costume, with some pants! We headed back to Town Square because I wanted a photo with Mickey and Minnie and the parade was passing down Main Street. 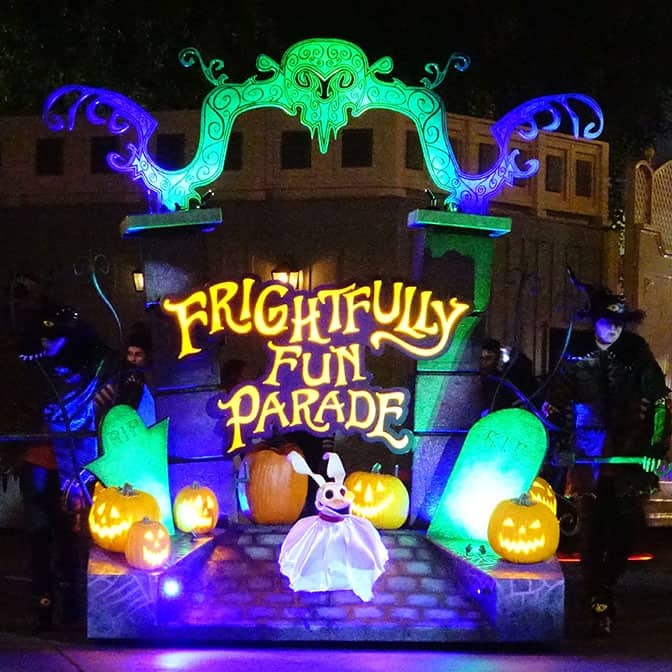 The best locations for the new Frightfully Fun parade were taken about an hour before the first parade and 30 minutes before the 2nd, but you could squeeze in somewhere shortly before, if it doesn’t matter if you are on the front row. You might get the evil eye if you try to move to the front though! 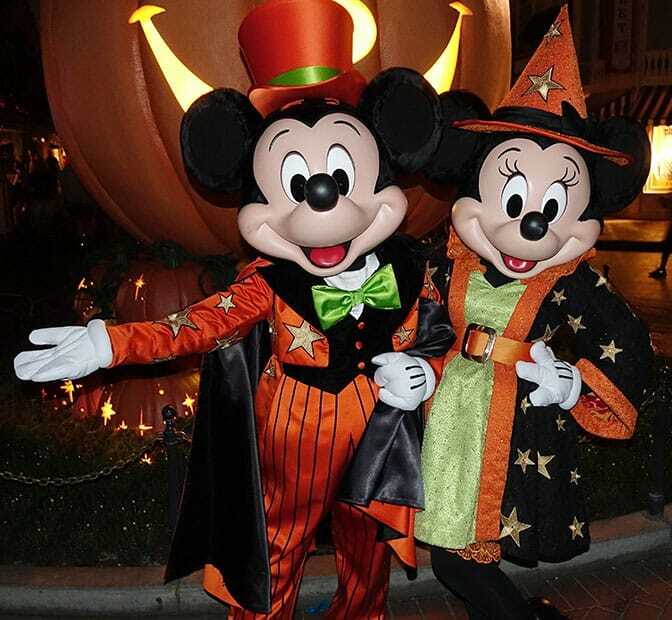 Mickey and Minnie were meeting on the Town Square side of the Giant Mickey pumpkin. 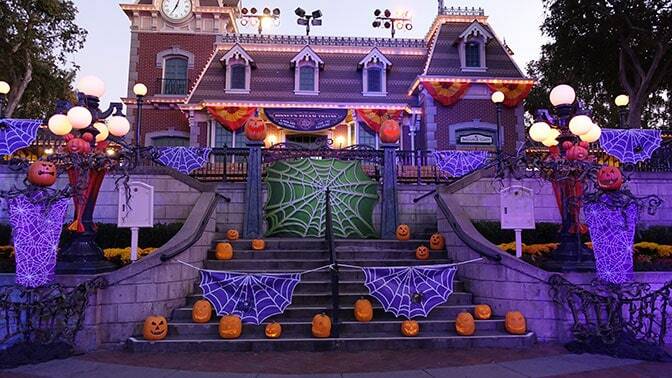 If you are in Town Square and you are looking at the Castle, the line formed to the LEFT. The line wasn’t very long, but it took over 30 minutes and I caught them right before the first fireworks blast went off. 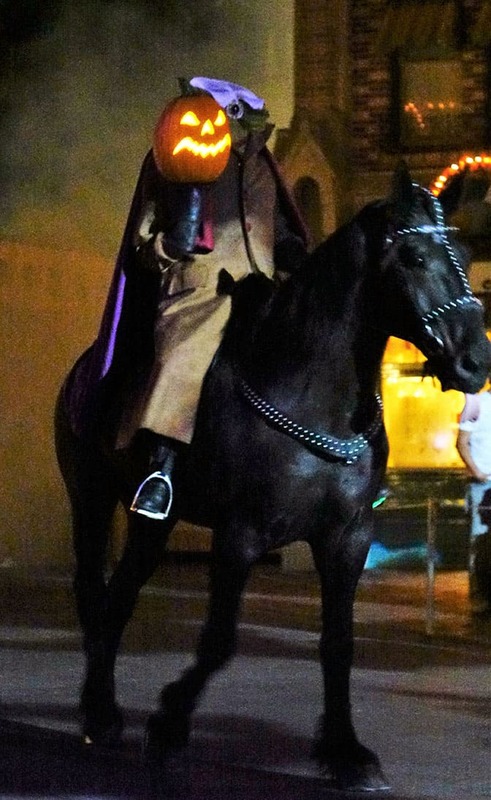 The headless horseman is new to Disneyland. He walked very slowly up the street. A NOTE for the parade. The FIRST parade began at it’s a small world gate and the SECOND parade began in Town Square! The HH came out of the gate about 5 minutes early. 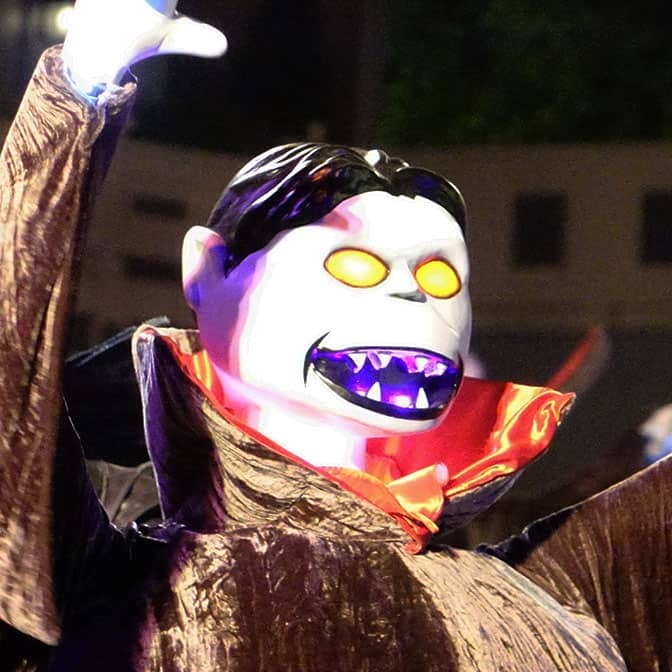 The all new parade features new floats, dancers and Disney villains. 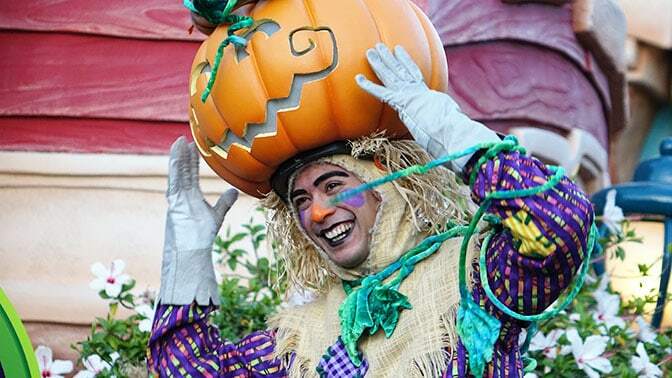 You won’t find Disney characters in costumes like you do in Walt Disney World’s Boo to You parade. It’s much shorter too. 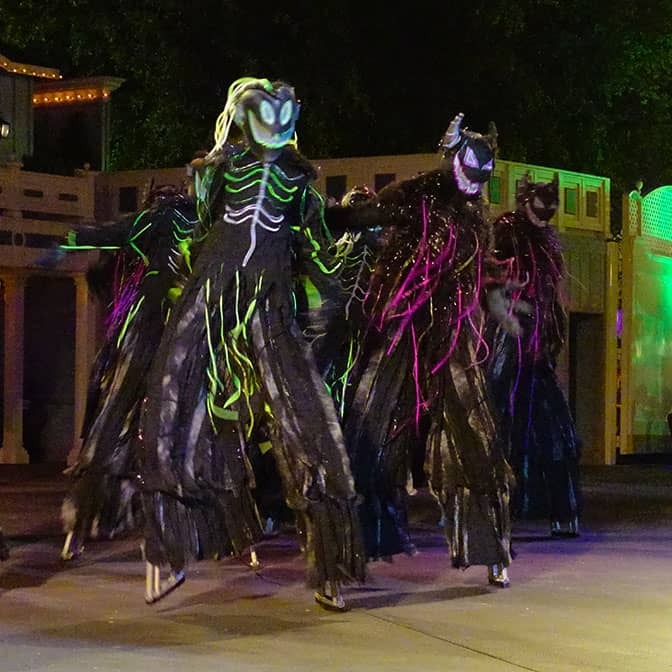 Bat inspired dancers follow the first sign float. Then these odd looking vampire things follow along. 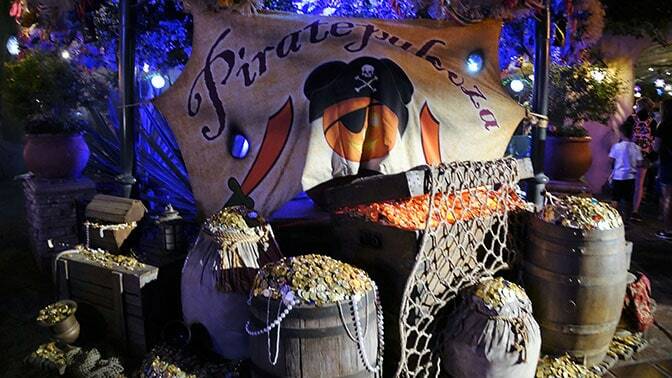 The Mayor of Halloweentown then follows in his special car. 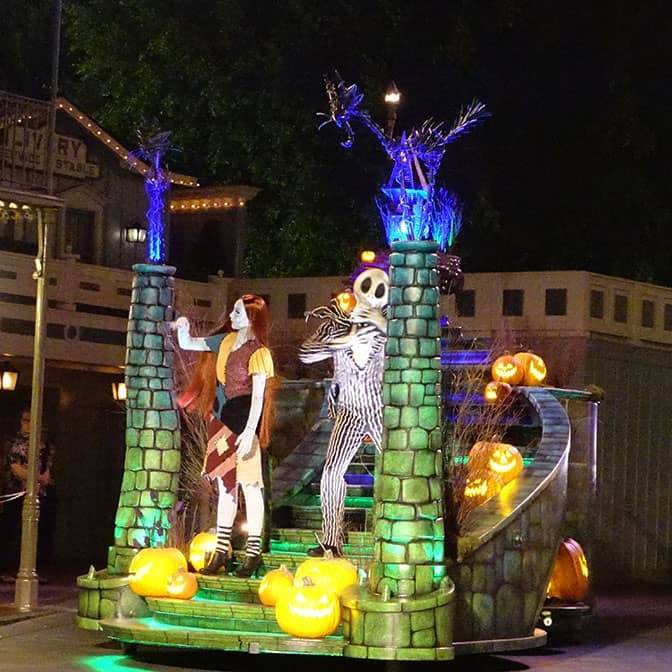 Jack Skellington and Sally follow behind on their float. 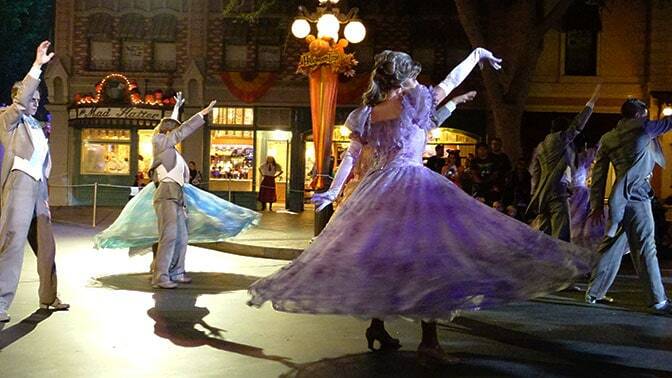 After the Halloweentown floats are the Ballroom dancers and the Haunted Mansion float. 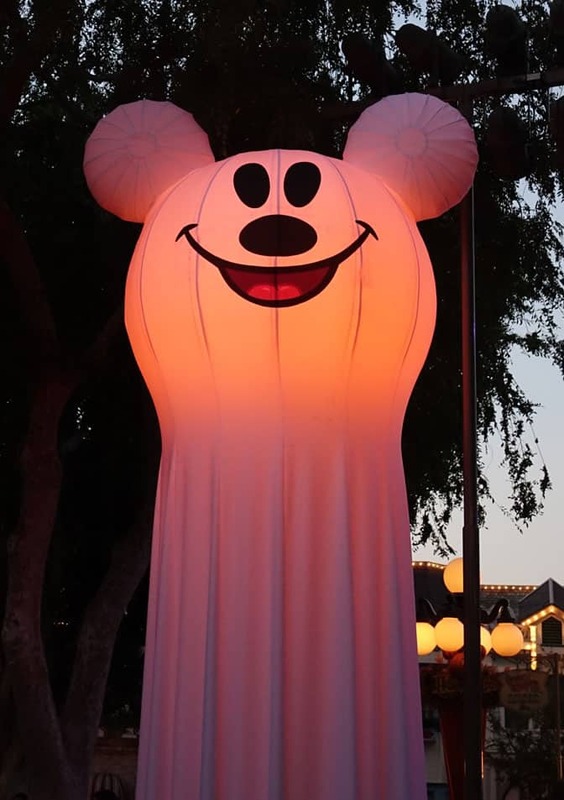 He’s pointing to let you know where you can see him, but you can’t see him from mid-September through early January as Oogie Boogie kicked him out. 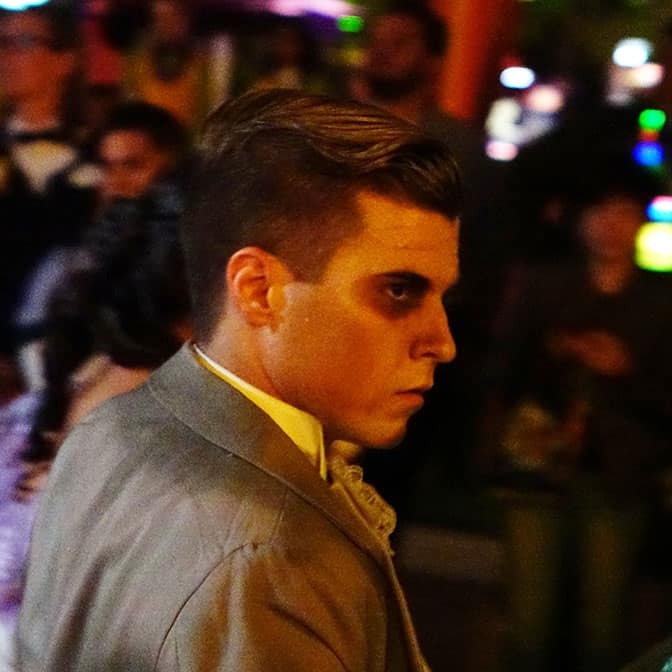 Following them are the graveyard gang. There’s no bloodhound in this parade. Grave diggers are more western inspired. 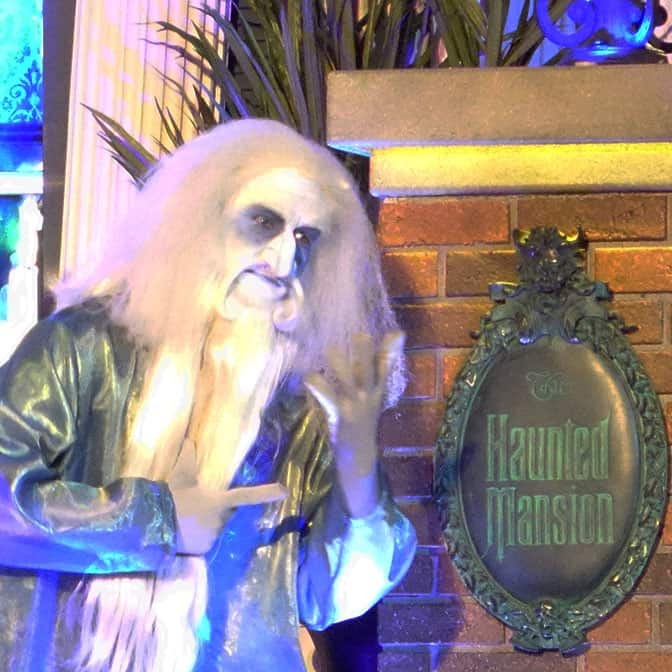 That would work really well in Paris, but Haunted Mansion is in New Orleans Square here? Oh, well, at least they scrape the ground occasionally. 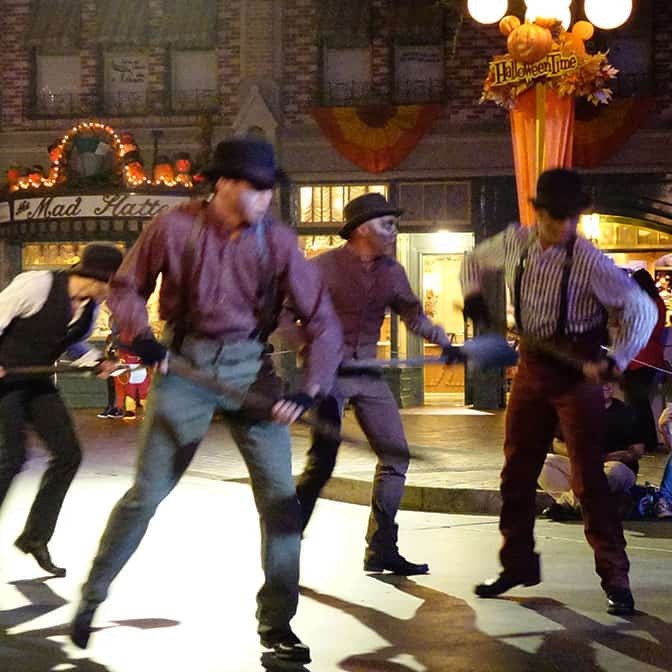 Dr. Facilier then brings out some friends from the other side. 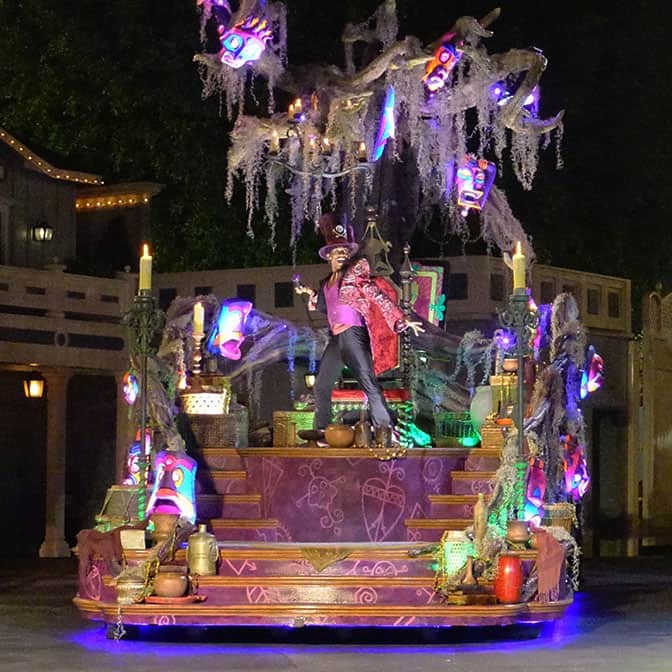 Facilier has his own float with tarot cards and tiki type faces. He’s really happy because he only has to do meet and greets during the daytime. Queen of Hearts, Gov. Ratcliffe and Capt. 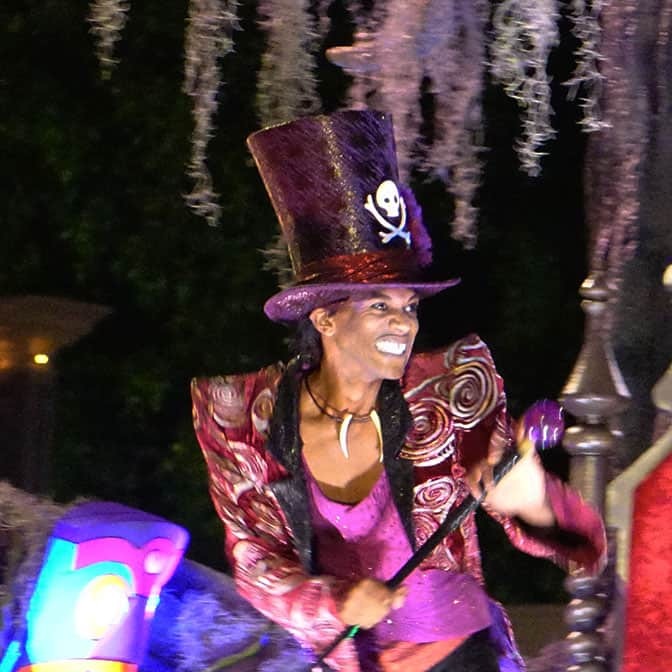 Hook were the only characters that walk the parade route. 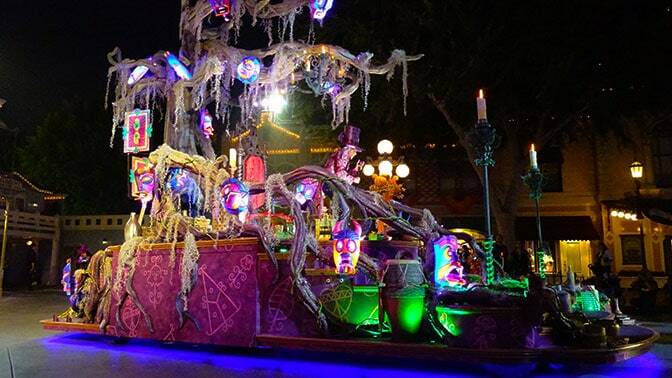 The villains float is very detailed and very impressive. 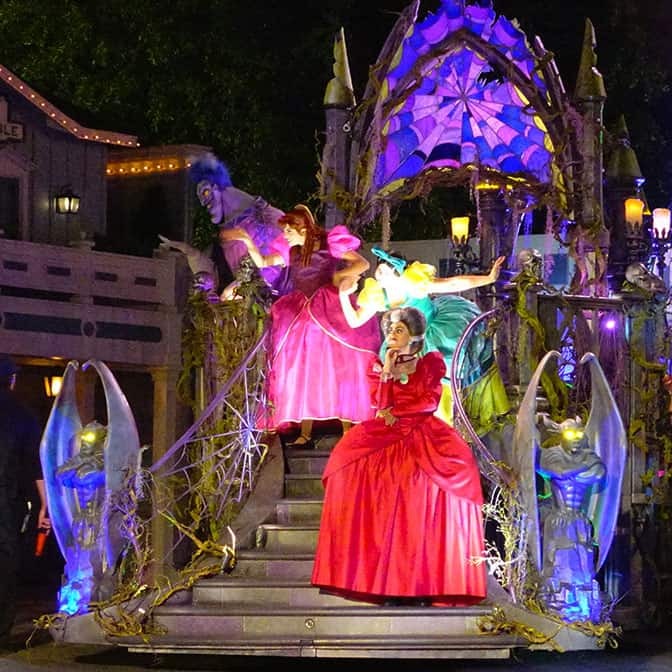 It has the Tremaine family, Hades, Frollo, Jafar, The Queen and Cruella on it intimidating party guests. Lady T smiles for the camera. I loved this photo. I liked how the smoke rose in front of the Queen. Stop brooding about smoke Pirate and finish this post! Jafar on the other side. The price went up. This first party was sold out at $89 per ticket. Every Friday and Halloween night sold out quickly as they always do. They added a nice parade, that hopefully will improve with time. 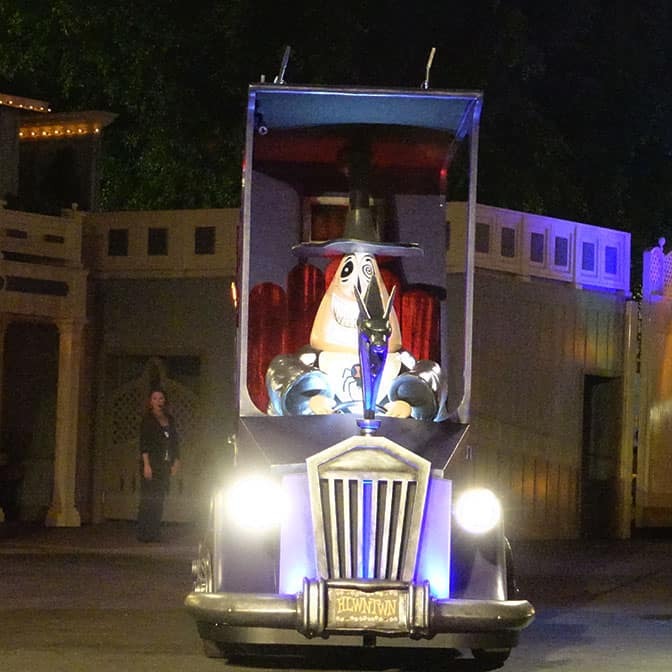 It’s not Boo-to-You quality, but it’s far better than the old Cavalcade they once offered. 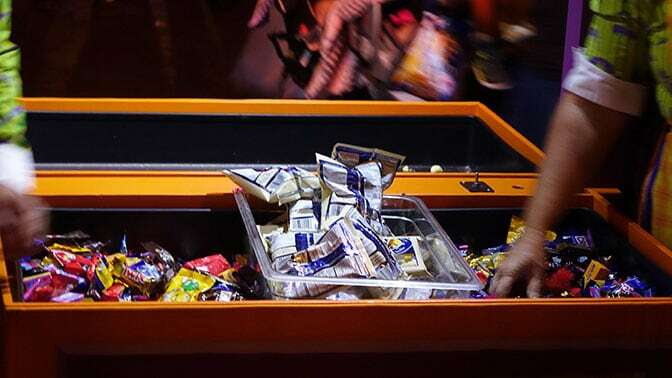 The candy is abundant and easy to get. BUT they cut the best part of this party, only FOUR villains available for meets takes away from what guests really want. 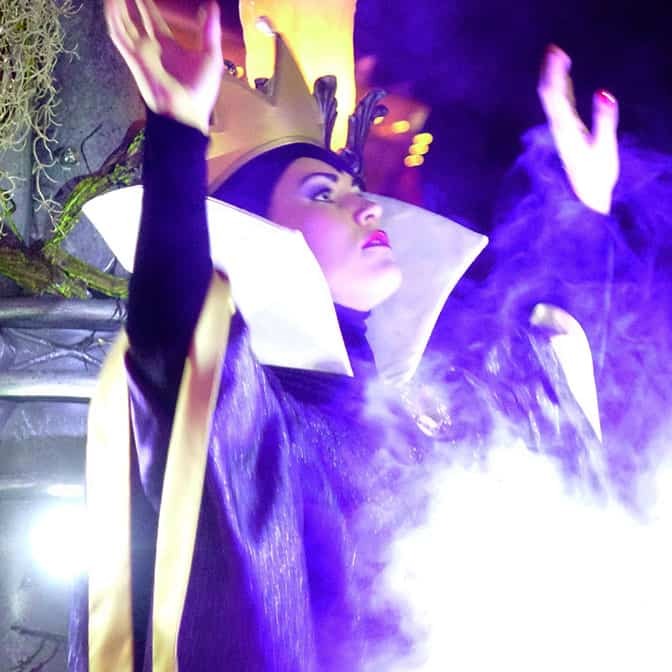 I recommend meeting Maleficent after the 2nd parade and use your early time to focus on characters you want to see. I’ll write up another post for you after visiting on Monday with additional details and photos. First, how were the lines for the rides? Im trying to do all the rides since ive never been to disneyland before, while making use of this event. I want to know if its possible considering that ill get there from 3pm and stay till closing time. My priority here is the rides. In what order should I gocif im starting on the afternoon. Most are low, except Space and Mansion. Could easily do them during the day though. You mentioned to be in line by 5pm? What exactly is this for? The party starts at 6pm correct? Also you mentioned candy is easy to get, are there not long lines for these? Thanks so much. This is an amazing review. Toontown Pre-party. It’s detailed in the post. No the lines are too long for candy, maybe a couple of minutes. 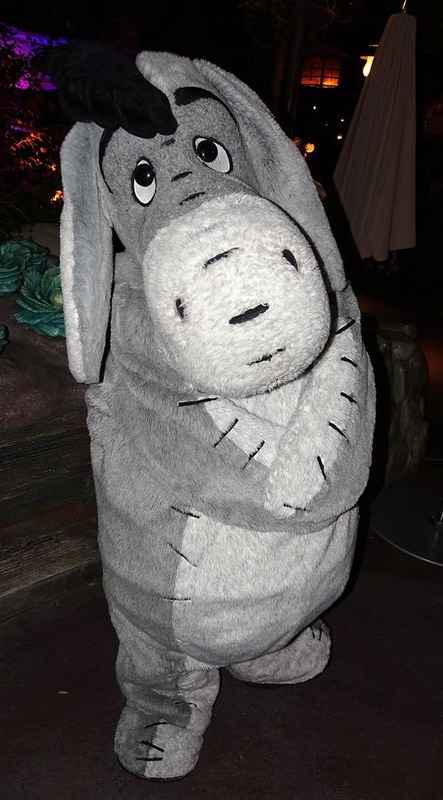 Let’s say you have a 2 year old who will want to see some Fab 5 type characters, but neither he– nor anyone else in the party– is going to want to wait in really long lines. Any suggestions? Maybe Toon Town before they close it? Or Rancho Del Z? 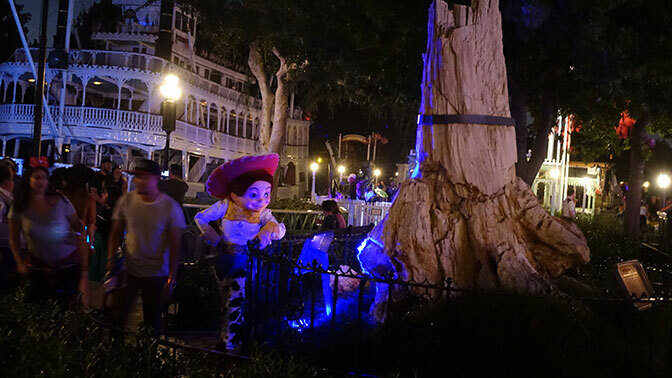 Are characters out and about at Rancho the whole evening? 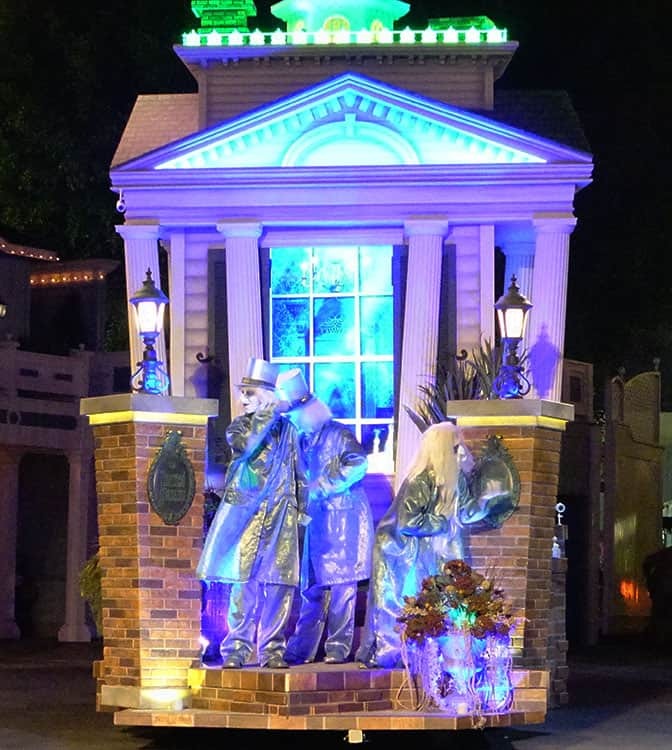 How crazy is Town Square for characters? 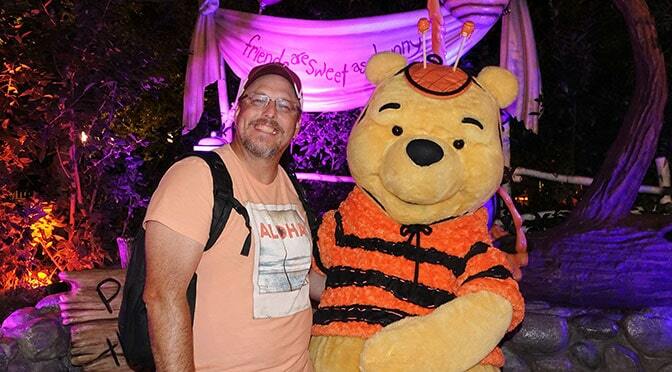 Do you know of any PhotoPass Magic or Animated shots exclusive to the party? 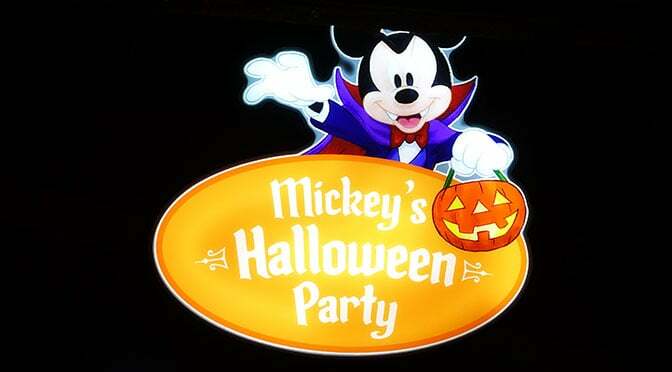 I know about the ones for the party in WDW but couldn’t find any info on ones for this party. 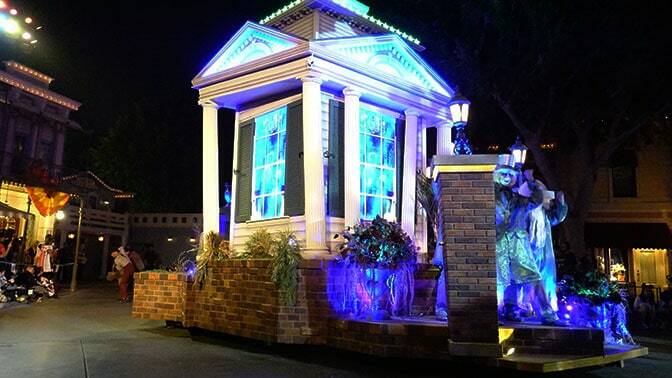 If you know of any, can you describe them and where they are located? Thanks. So if the party starts at 6, will the villains start at 6:45? 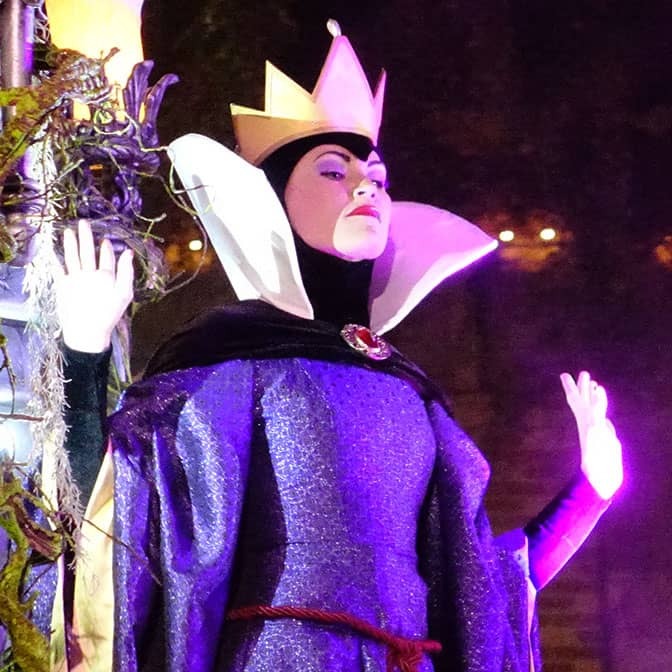 Also, do the Evil Queen and Maleficent sign autographs? Kenny, did you see the musical presentation after the parade in front of the castle. It had the three witches from Hocus Pocus. It was one of the best shows I’ve seen there. Good voices and music. I think you’re referring to Walt Disney World’s Hocus Pocus show. 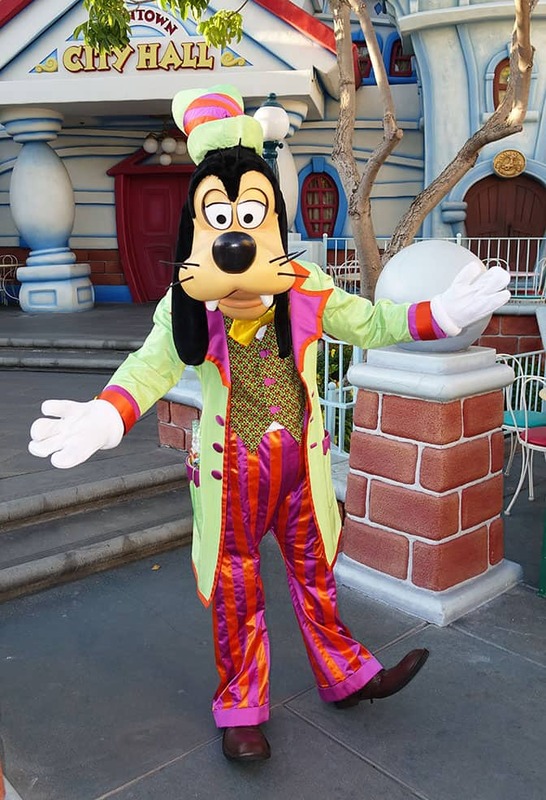 How long did it take you to see all the characters in Toontown? 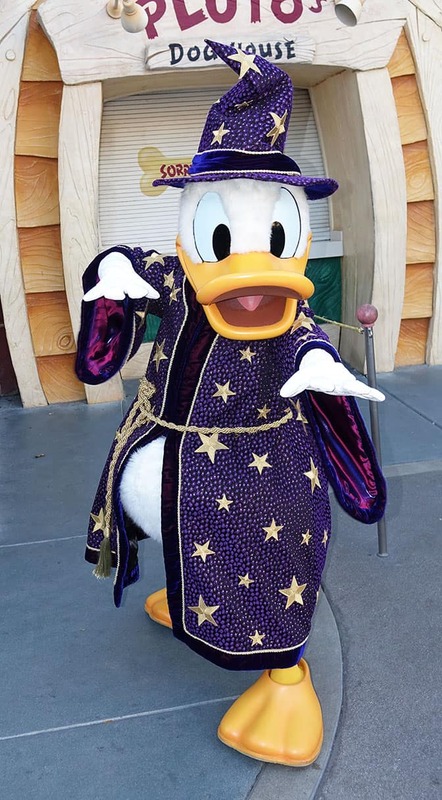 Since you were first in line for Mickey and Minnie, which character was your longest wait? Thanks! We arrived to line up at 5pm. They opened the gates at 6pm. 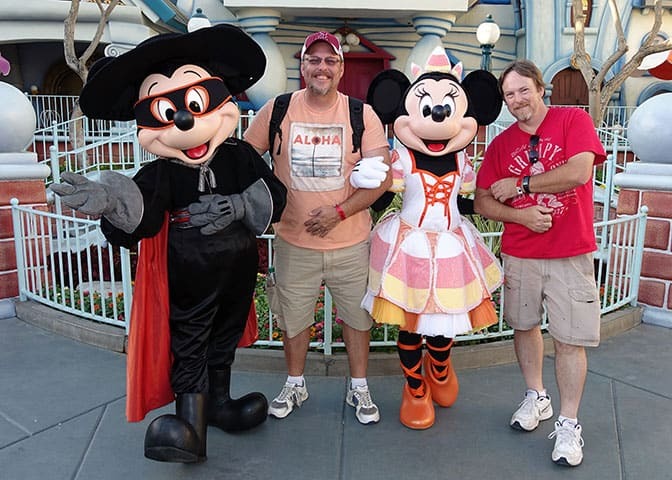 We met Mickey and Minnie with a very brief pause. 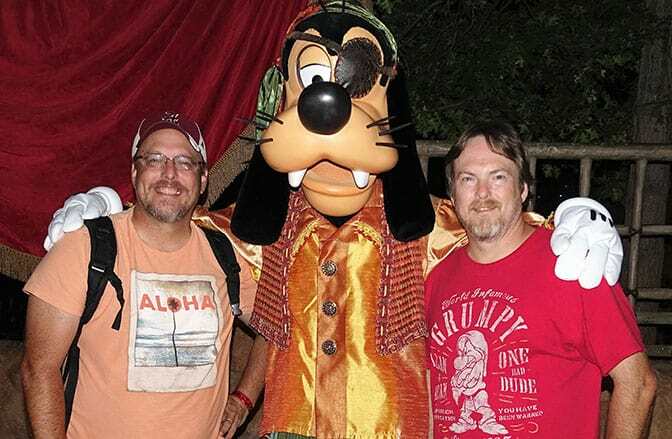 We then met Goofy with no wait and Donald with a short wait. The line for Chip n Dale was about 30 minutes by that point. The line for Daisy was more like 10 minutes, but became much longer as were were entering the line. Hi thank you for this post! 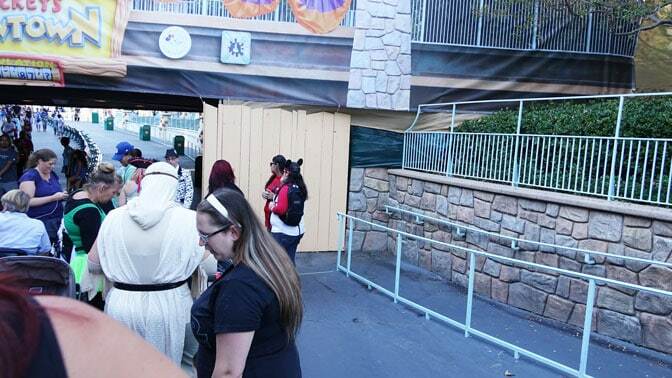 When they open Toontown do they direct you or is just a madhouse and everyone runs in, lol? Also, do you have to special request the snacks for your kids? I have a 3 year old and we don’t eat that much candy, I’d rather have apples and carrots! They release people in the order they arrived. Just tell cm at candy stops what you desire. 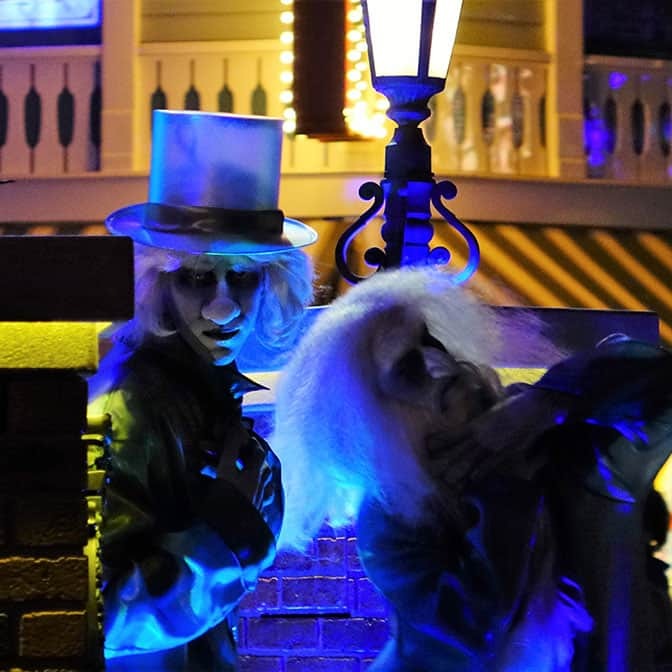 How was the crowds/lines for rides? Very low or non-existent. Ghost Galaxy and Haunted Mansion only had lines of any kind for 2 hours, but Splash Mountain had posted 30 minute wait until 10pm. 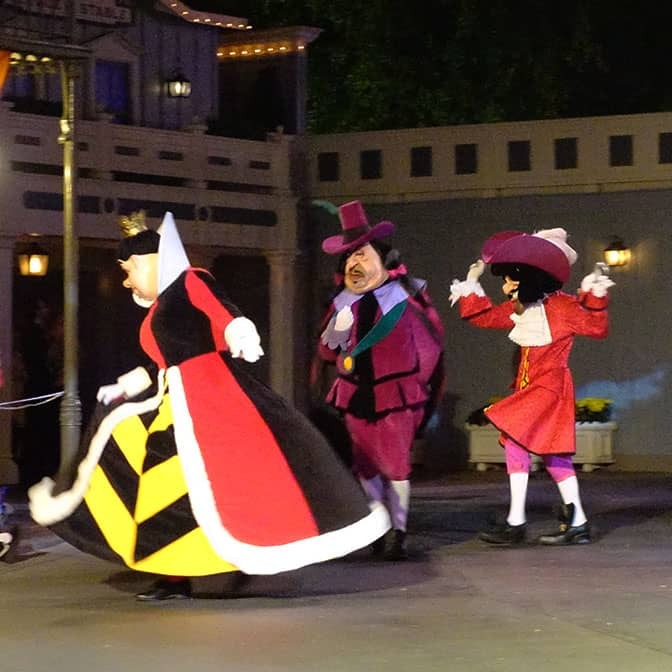 I thought good ‘ol Mr. Frollo wasn’t it the parks anymore, or is he only here for the parade? Also, I’m led to believe those weird vampires were the ones from The Nightmare Before Christmas. It sounds kind of wonky, to be honest, but the second one you showed had a striking resemblance to one of the three from the movie. It was my family’s first time there! We had a great time! We did get to meet Wendy, Peter Pan and Capt Hook by the riverboat. They switch out to Capt Jack Sparrow. Outstanding review Kenny! Thanks so much for your efforts and pictures. 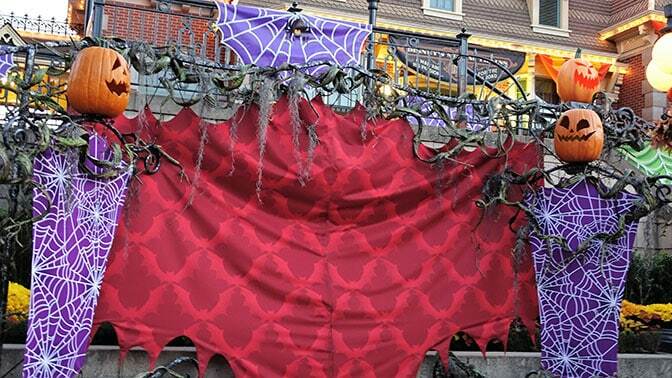 I agree with quality/quantity vs MNSSHP. Very happy I live on the East coast. Headed down to 10/6 party from TN. Can’t wait! We will be there in two weeks, and doing the party on a Monday. I think the 10th. I’m looking forward to your review of a Monday trip. This will be our first time and I hope it was a good choice. Thank KtP for another awesome review, tips, and suggestions!! 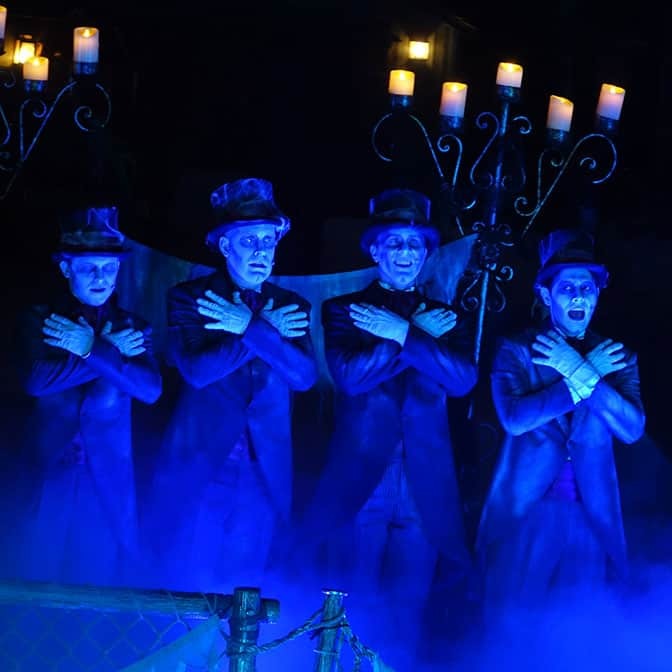 Let’s hope they realize they indeed need more villians at Toon Square!! 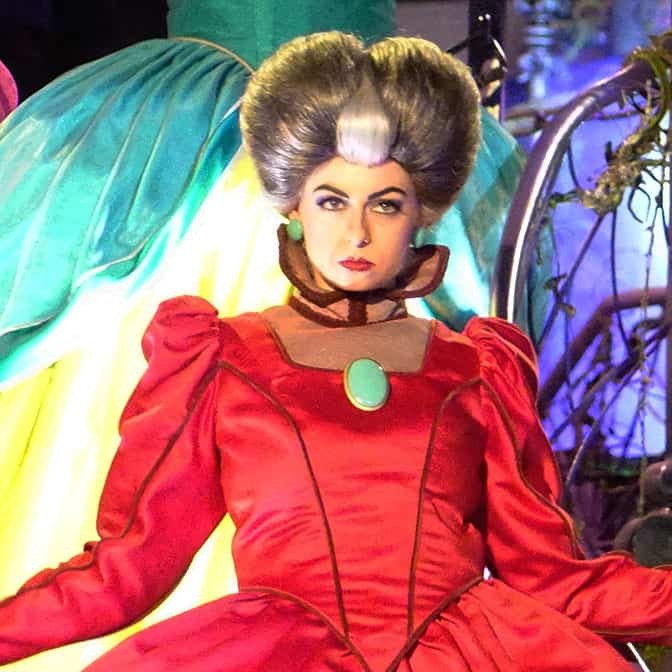 Like Frollo, Lady Termaine, and the only I bought the tickets to meet Gov. Ratcliff!! I’ll be looking for updates from Mobdays Party. Thanks again!! Those aren’t odd looking vampire things, those are the vampires from NIghtmare Before Christmas (in keeping with what you described as following them). 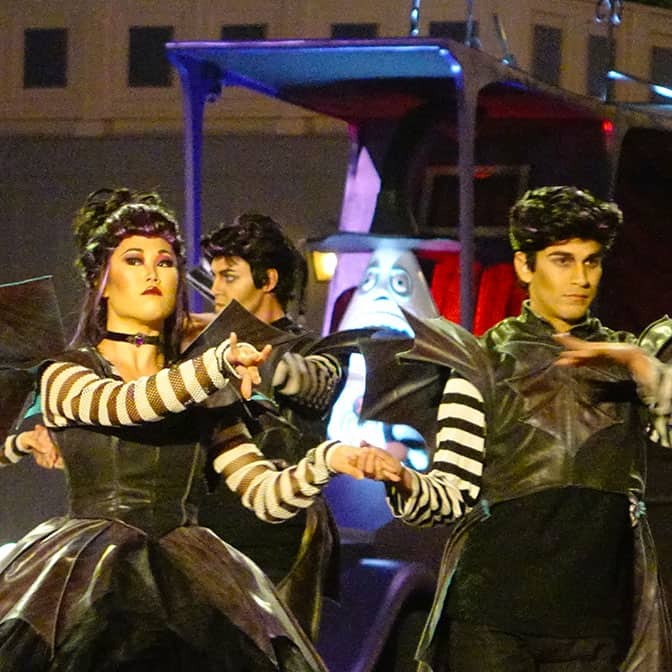 The bat inspired dancers also look like NBC types. Thank you for wearing your Tourist costume That’s quite clever!